Welcome to Captain's Row! 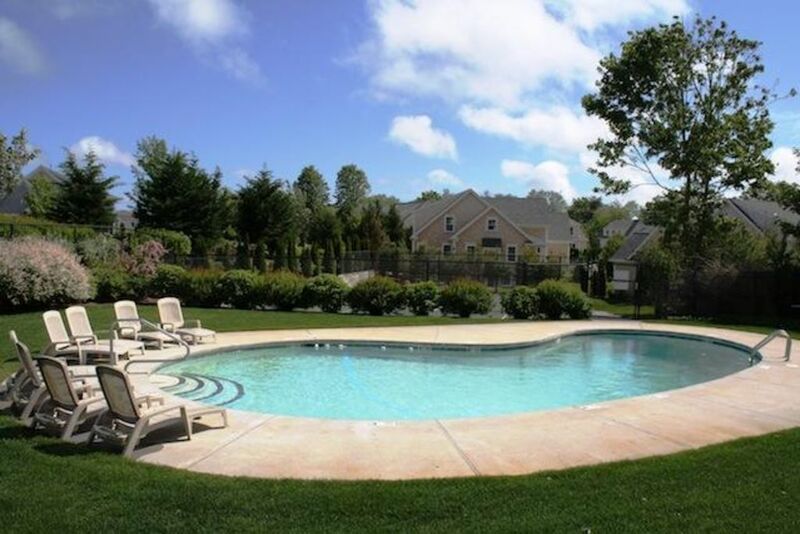 Enjoy easy resort style living in this newer Cape Cod Vacation Rental home in Chatham. This home is in its own residential sub division and is close to beaches, restaurants, downtown and includes a community pool & tennis court (Only 130 steps from your door!). Also offering Central AC, free WiFi, garage, finished lower level, main floor laundry, & private patio with gas grill. This home comfortably sleeps 10 with all beds and no sleep sofas. Enter the front door and the living room is on the right. The open living area has wood floors, a gas fireplace, cathedral ceilings, & a French door to the patio and gas grill. The living room opens to a dining area with seating for 8. There is a fully equipped kitchen with breakfast bar and granite counters. For convenience the washer/dryer is located in a hall off the kitchen. The guest has use of the garage for bikes and extra storage (no cars in garage please). To the left of the living area is a 1/2 bath in the foyer and Bedroom #1. This bedroom has a King bed and an en suite bath (shower only). Upstairs is a loft area for overflow guests or office. There is a seating area with Flat Screen TV. To the left of the loft area is Bedroom #2 with a King Bed and a "Jack-n-Jill" full bath (tub/shower combo). The finished lower level includes another living area, game room with Flat Screen TV, full bathroom (shower only), and 2 bonus sleeping areas for guests. The lower level has 2 twin beds in the game room area and 2 Queen beds in a private sleeping area (Bedroom 3- this room has a door for privacy). There are 5 flat screen TV's in this home for everyone in your family to enjoy. This home has a garage for you may store extra bikes, beach stuff etc inside and there are 2 parking spaces outside of unit for your use. There is limited visitor parking for the complex around the corner on John Gilpin Lane at the wider end of the Road - if you have more cars during your stay that need to be parked overnight, you can use the lot in town on RT 28 - the cost is approximately $5 a day. No Smoking, NO PETS Please! Max parking of cars at property: 2 - No parking on lawn anytime. This home has Keyless Entry for your convenience and a 3pm Check-In/10am Check-Out. Only 130 steps from the home to the pool! 250 Feet to Chatham Fish & Lobster - fish market and restaurant serving the best lobster rolls around! .7 Mile to Del Mar Bar & Bistro - stop here for cocktails! Welcome to New England Vacation Rentals. We are a professional vacation rental home and property management company offering vacation home rentals on Cape Cod. Enjoy our vacation beach homes in Harwich, Chatham, Brewster, Orleans, Hyannis, Eastham, Truro, Centerville, and West Yarmouth. Cape Cod Vacation Rentals are available for Fall, Spring, and Summer. We will help match the right vacation home in Cape Cod for your lifestyle and budget. We live on Cape Cod can help you with the ins and outs of finding the “just right” holiday home. Check out our Free Mobile App for Android and Apple users to find out where to eat, tour, shop and be a “local”. Memories are made in our Homes!